Media Size Choose an option12" x 20"18" x 30"
With a little creative embellishing “Motor Marc” has created another sepia print from his original art piece called The Guardian. This painting exhibits a softer, more golden feel of how he imagines heavenly angels soaring down on earth. 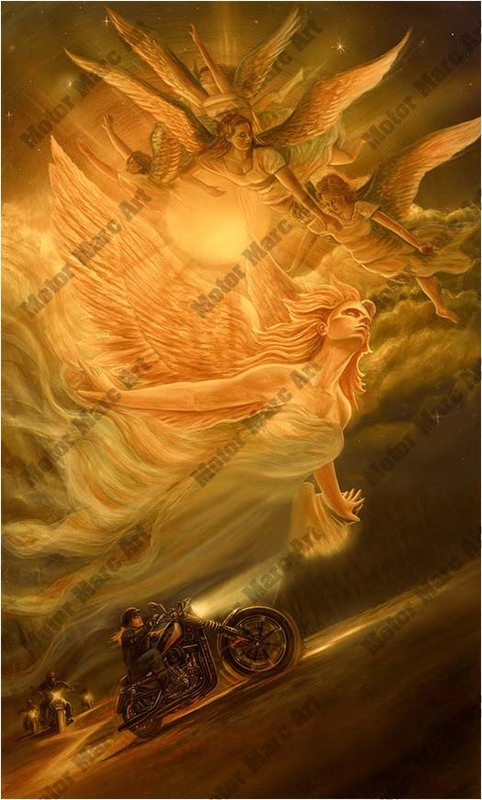 The power and thunder of the engines are the prayers that call the angels down from above, giving all riders the courage and strength to travel through all life’s journeys as their paths are guided with empowerment of the angels. We all need guardian angels. 12" x 20", 18" x 30"